A pair of researchers at the University of North Carolina has developed a way to use an organocatalyst to stereocontrol polymerization. In their paper published in the journal Science, A. J. Teator and F. A. Leibfarth describe the process and outline some ways the results could be used. Jeffrey Foster and Rachel O'Reilly with the University of Birmingham have published a Perspectives piece on the work done by the team in the same journal issue. Polymers are substances with a molecular structure that is generally made up of like units bound together—they are typically found in resins and plastics. In this new effort, the researchers endeavored to create a polymer that would have more adherence, making it more useful as a coating material. They noted that the two most popular polyolefins, polyethylene and polypropylene, do not adhere well because they are made of hydrogen and carbon—to become adhesive, they need oxygen. Prior research has shown that poly(vinyl ethers) (PVEs) can be made using free radical polymerization, but the results lack stereochemistry, which means they are not very strong or reliable. 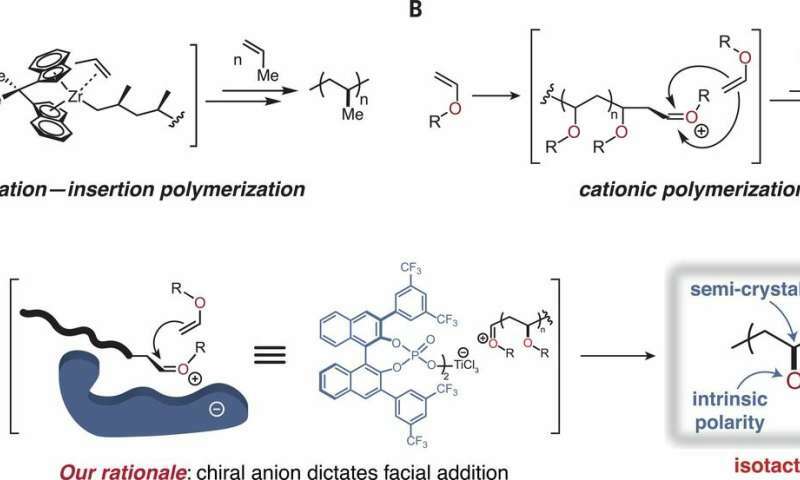 That led the researchers to devise a new approach that would allow catalyst control when making PVEs, which would give them well-defined stereochemistry using cationic polymerization. Stereochemistry refers to the three-dimensional arrangement of atoms that make up molecules and the impact that the arrangement has on chemical reactions. In their new approach, the researchers used an asymmetric phosphoric acid combined with a Lewis acid (titanium) to force the monomer into a desired orientation during ionic polymerization—the organocatalyst enabled the researchers to exert complete control over the resulting stereochemistry. The polymer they created was semi-crystalline, and testing showed it to be both strong mechanically (comparable to polyethylene) and highly adhesive. Foster and O'Reilly suggest the new approach could lead to the development of both adhesive coatings and medical devices. They also note that the new approach is scalable and amenable to various types of processing such as melting, molding and coloring. They also note that the concept behind the new approach appears to be transferable to other types of polymerization systems, which suggests a whole new class of products could be forthcoming.